Sree Nataraja Post-Graduate Centre, affiliated to the University of Mysore, Mysore, started during the year 2012-13, is imparting education leading to Master of Commerce (M.Com) degree. In the First year, University of Mysore had sanctioned 80 intake to the course but the Centre selected only 72 students, of which 45 were girls and 27 boys. Preference is given to girls at the time of admission since the Centre comes under the control of Sree Nataraja Residential First Grade College fo Women. The first batch of students have succefully completed two semesters bringing 100% pass results with more than 40 students securing more than 8 total grade points in the examinations conducted by the University of Mysore. This is the second year (2013-14) of the Course at the Centre and we have admitted 60 students to the course, of which 37 are girls and 23 are boys. The course fees charged by our college is the lowest compared to other private Institutions which are offering M.Com course under University of Mysore. The Centre is encouraging the students in the field of extra-curricular activities also and the first batch of students have bagged a number of prizes and trophies by taking part in a number of such activities including academic competitions. The library of the P.G. Centre is well stocked with over 500 titles of books in addition to titles meant for reference. The Centre has also subscribed to a number of journals and periodicals. Added to this is a Computer Lab to serve the needs of the students in their higher studies. Facilities like well planned class rooms, internet facilities, smart class etc, have enhanced the academic ambience of the Centre. 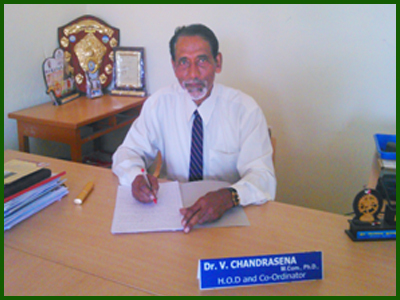 Dr. V.Chandrasena, Professor and Principal (Retd), is heading the Centre as the Co-ordinator. With over 40 years of teaching and administrative experience, he is leading the students is their studies and research work. The other members of the faculty Smt Veena Kumari, Sri Deepak, Sri Srikanth and sri Pavan S Rao are well qualified and experinced. They are committed to teach and train the students to be become fully equipped to take up any responsibility in their chosen career. Admission Procedure as per the guidelines laid down by the Government/University of Mysore. @ Copyright 2013 Sree Nataraja Post-Graduate Centre. | Powerd by : Teclore Technologies Pvt.Ltd.